Only time will tell whether the Ontario provincial election held on June 12, 2014 was some intriguing watershed in the political history of Canada’s most populous province. Meanwhile, we found that we were drawn to covering this election in some depth — without thinking all that much about why at the time. And just in case it does prove unusually significant, we’re posting a digital record of our coverage here (for a while at least). We had our first toe in the water on what finally became the June 12, 2014 Ontario general election as early as January 21, 2014. 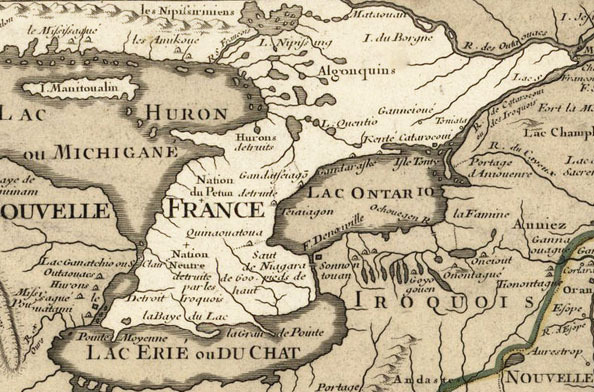 Southern Ontario in the early 18th century. Already it seems no accident to us that, one day before all this truly came to pass, our counterweights site was obsessed by the latest US and Canadian media adventures of Toronto Mayor Rob Ford. It is also no accident, we think, that some of the immediate background to Kathleen Wynne’s ultimate Ontario electoral achievement involves the Mayor of Toronto (who is probably still more popular in so-called Rural Ontario too!). 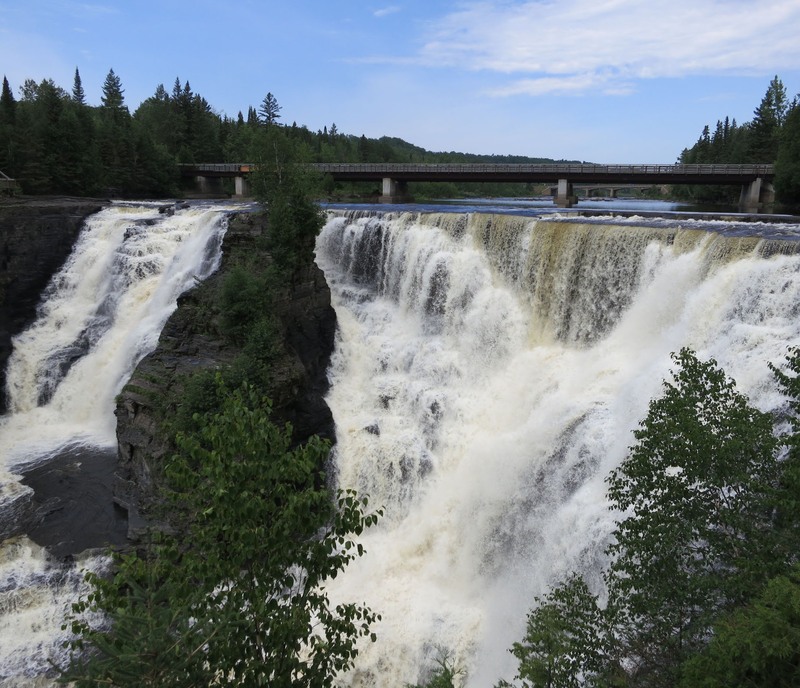 Kakabeka Falls in Northern Ontario, near Thunder Bay — “the second highest waterfall in Ontario with year round access for viewing.” And on the “Historic route of the Voyageurs,” in the first modern Canadian resource economy romance of the transcontinental fur trade, from coast to coast to coast. An interesting question about just how it all finally hit the fan is just who knew what about what, and who, when? And it may have prefigured what finally happened that Premier Wynne’s Liberals were so quick off the mark. At any rate the die was cast by the evening of May 2, 2014, when the vast geography of Ontario, from the Great Lakes waters to Hudson Bay, and the Ottawa River to the Lake of the Woods, quietly went to bed with spring in the air, after a long, hard winter. 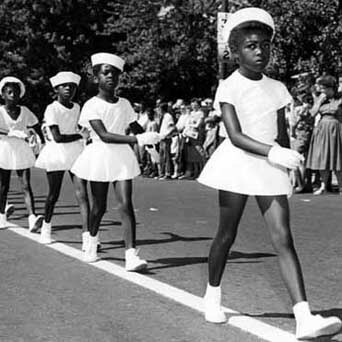 Emancipation Day Parade, Windsor, Ontario, August 1959. 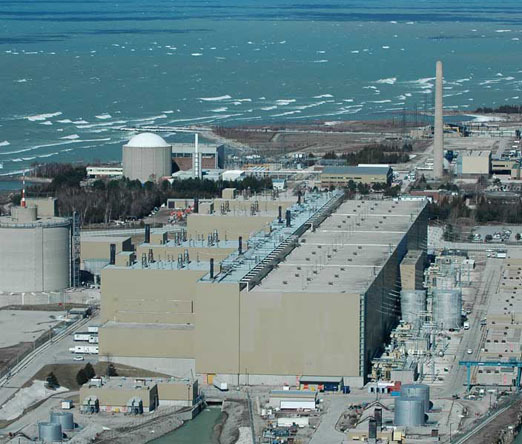 The CANDU Bruce Nuclear Generating Station on Lake Huron, in Southwestern Ontario, said to be the largest nuclear power plant in the world. 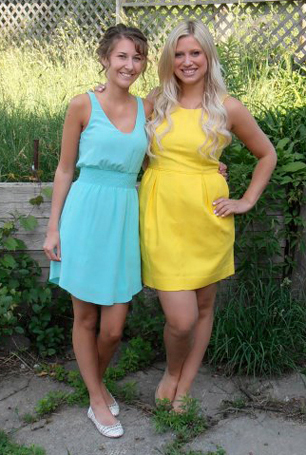 Stephanie Randall and Trella White, restaurant owners (and operators) in Elora, Ontario. 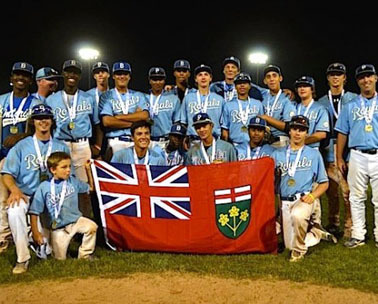 The GTA’s Brampton Royals, Baseball Canada bantam champions, 2012. 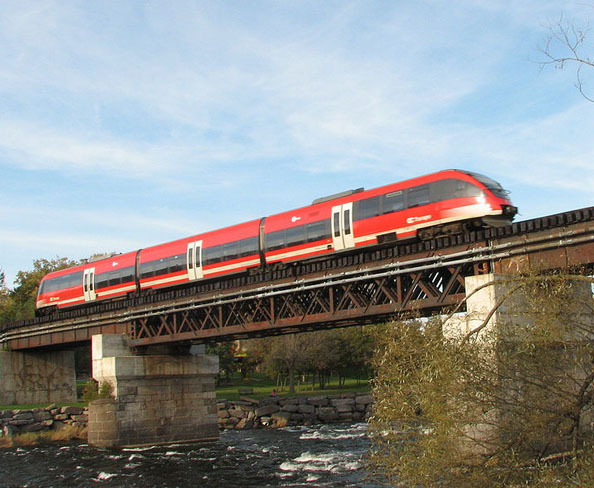 A light rail O-Train in the Ottawa region of Eastern Ontario. CONCLUSION : WHAT IT ALL MEANS? 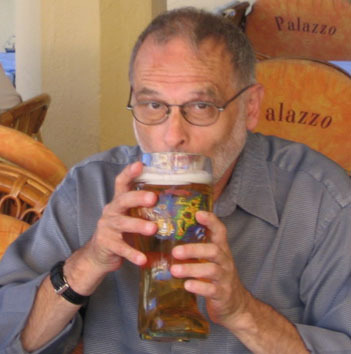 As of this writing, Dr. White says he has nothing to add to this immediate assessment, just yet. Except that he does think it was apt to talk about the June 12, 2014 Ontario general election as a “Northern Uprising” (and, perhaps a bit less credibly, a northern uprising by “We The North”). 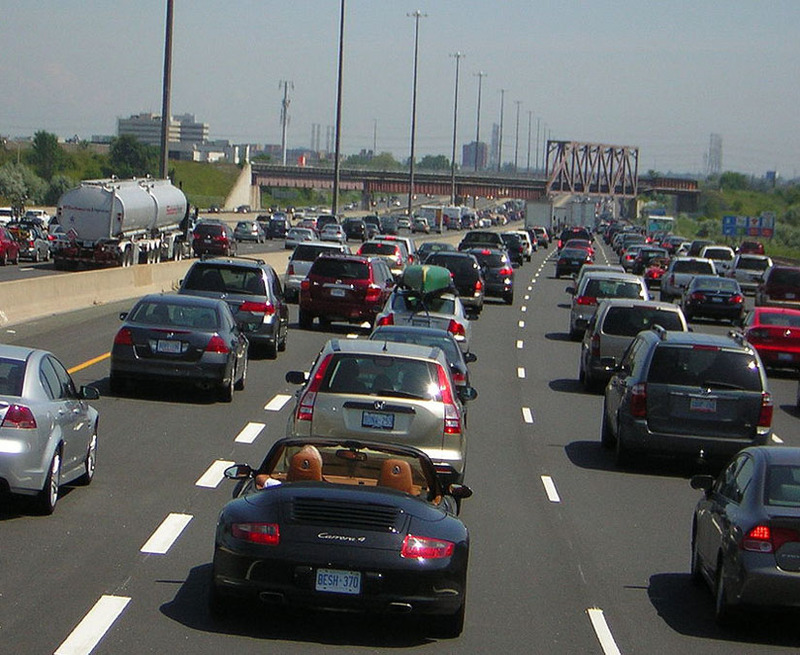 Gridlock on Highway 401 — one issue in the 2014 Ontario election campaign. In the end, there was a northern uprising. It was made by the regional Liberals and New Democrats against the kind of mindless right-wing austerity ideology currently affecting such anglospheric places as Australia, now perhaps even the world’s largest democracy in India, and of course the United Kingdom (and regionally represented in Ontario by the so-called Progressive Conservatives under Tim Hudak — who everybody who was anybody said actually won the TV debate). 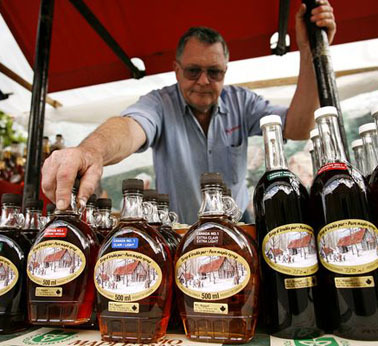 A vendor sells maple syrup on Front Street in Toronto ... Photograph by Martin Thomas, Alamy. The Red River Expedition at the portage around Kakabeka Falls, Ontario by Frances Anne Hopkins, 1877. Hopkins was the wife of a Hudson’s Bay Company official, and she sometimes accompanied her husband on his fur trade travels. 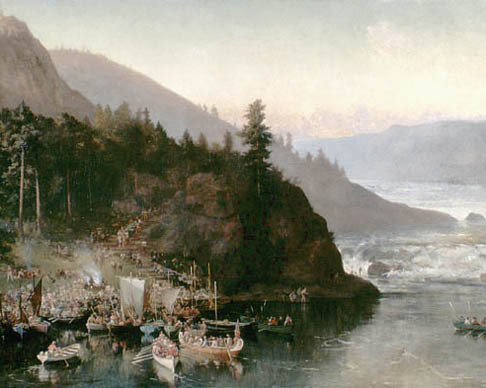 Her historical painting here depicts the Red River Expedition of 1870 portaging around Kakabeka Falls, on its way to the Red River Colony to stop Louis Riel’s first or Red River rebellion. (8) Première lesbienne à diriger une province canadienne, Kathleen Wynne devient avec sa victoire la première première ministre LGBT élue dans un pays du Commonwealth. Un jalon accueilli dans la plus grande indifférence par les médias et le public ontarien, alors qu’André Boisclair avait d?, lui, essuyer des railleries homophobes lors de la campagne électorale de 2007. * Moody’s changes Ont. outlook to negative from stable …? The change in outlook affects approximately $250 billion in debt securities, Moody’s said as it reaffirmed Ontario’s Aa2 ratings. * Throne speech to lay out Liberals’ long-term agenda: finance minister … Liberal Dave Levac was re-elected as Speaker, the often thankless job of playing impartial referee to unruly MPPs in the legislature. EAST TORONTO, JULY 3, 2014.